Portal Home > Knowledgebase > Client Area > What is Support Pin? Support Pin is your account ID which changes once a day. It is used in certain account-specific matters or when you need assistance with your services with us. In order to validate you as the account holder, we may ask you for your account Support PIN. 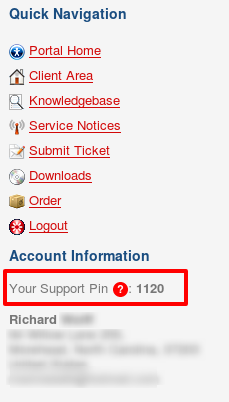 In order to get your Support PIN, please visit your Client area - Account Information and you will find it.